Tobias Carlisle: All right. You’re good to go? Phil Bak: Yeah, I’ll start. Tobias Carlisle: Yeah, let’s do it. Hi, I’m Tobias Carlisle, this is The Acquirer’s podcast. My special guest today is Phil Bak. He’s the CEO of Exponential ETFs. He’s got a really interesting background and he’s got some really interesting ETF, so we’re going to ask him about that right after this. Speaker 3: Tobias Carlisle is the founder and principal of Acquirer’s Funds. For regulatory reasons, he will not discuss any as the Acquirer’s Funds on this podcast. All opinions expressed by podcast participants are solely their own and do not reflect the opinions of Acquirer’s Funds or affiliate. For more information, visit acquirer’sfunds.com. Tobias Carlisle: Hi Phil, how are you doing? Phil Bak: Hi, how are you? Thank you for having me on. Tobias Carlisle: My absolute pleasure. What is a reverse market cap? Phil Bak: So reverse cap is very simple. We take the … In this case it’s on the S&P 500, and we take the UNIX constituents S&P 500. Now we’re at typically the S&P 500 of course is weighted biggest to smallest. So it’s weighted by market cap. We take the reciprocal of the market cap, so one over the market cap and then we weigh the weight based on that. So what you get is a portfolio where rather than being tilted towards the bigger companies, you are tilted towards the smaller companies. You still have full representation over all 500 companies. It’s still a large cap fund, a weighted average market cap of our fund is 18 billion. But what you get is really two things. Phil Bak: One is you get a size tilt, so a small money speed factor exposure within large cap, but the other thing is that if you think about how an index re-balances, certainly a market cap weighted index, every quarter you have a rebalance semiannually, you have a reconstitution and every time you rebalance you re-up all the different stocks to their market cap. So you’re selling to the losers, you selling the stocks that have gone down and you’re taking that excess capital, you’re putting it into the winners. You’re always by rule buying high and you’re selling low. Phil Bak: And what we’re doing is the opposite. We’re buying low, we’re selling high. Every time the company runs up, when we hit rebalance, we take money off the table, we profit take and we put it back into the companies at the bottom of the S&P 500 that we feel and historically have had more room to run. And that rebalance mechanism is actually a larger driver of historical alpha in the fund than the size tilt. Tobias Carlisle: So the rebalance is the thing that drives your returns because in some ways it’s a little bit, it’s like quasi value investing or pseudo value investing. Is that what you see? Phil Bak: That’s right. Yeah. The factor loads currently, and it’s cyclical, but the factor loads right now are stronger towards value than they are towards size, which is very counterintuitive. Now in an environment that’s a value environment that can shift back the other way. Not always, it’s always going to be value bias because you’re always buying low, you’re buying low, and you’re always putting money in market cap weight. By definition, you’re going to put money in the most overvalued companies, you’re going to have the higher allocation. Phil Bak: But there are times where we hit a value cycle, we hit an anti-momentum cycle, which is very different than the one we’re coming out of. But in those environments we’re going to have less of a value bias than we would in an environment like we do today. Tobias Carlisle: That’s interesting. In an environment like this one, which is more biased towards momentum and large cap type stocks, you find that the portfolio looks more like a value portfolio, but that can change in a different environment. Phil Bak: That’s right. And it’s the same thing on a sector level too. So if you look at it today, you’ll say, “Oh, this is like an anti-fang, anti-technology portfolio.” But if you look at it before the global financial crisis, it looked like an anti-financials portfolio because every time there’s a sector that gets out of whack in the S&P, we’re on the other side of it. So it’s a very interesting strategy. If you could distill it down, some people distill it down and say, “Well, it’s like a size play within large cap,” which it is, but I think a more accurate definition of what it is, is mean reversion as a factor. Tobias Carlisle: I was just going to say it is mean reversion, which is one of my pet subjects. Mean reversion is what’s driving the returns there. Tobias Carlisle: I funded it. It’s a fascinating idea because it’s one that if anybody who follows the equal weight S&P 500 versus the regular S&P 500 which is market capitalization weighted can’t help but fail to … I mean, you can’t help but notice the fact that over time the equal weight has that perform pretty materially a year on year. Not that it happens every single year, but there is this gradual advantage to being an equal weight. So I imagined that that is then magnified again when you look at the reverse market cap weight. Phil Bak: Yeah. So it’s not exactly a mirror image because in terms of the alpha between cap weight unequal and the alpha between equal and reverse cap is very close. The reason why it’s not an exact mirror is because the smaller companies, the deviation to the mean is a lot smaller than on the large side. So for example, in the S&P 500, the weighted average market cap, the mean market cap of all the companies is about 200 billion right now. But Apple is, I think it’s still over a trillion, right? So it’s five times bigger. Phil Bak: There’s no company in the S&P that’s one fifth the size. So you have much more of a dispersion. What that also means for reverse cap is that you get a far more diversified basket in reverse cap than you do in market cap weight. So people talk a lot now about the concentration in market cap weighting, the top holdings are for a little over 4% now in market cap weighting, the top weighting, sort of reverse cap. We have now one that ran up to about 120 basis points, which is very unusual app rebalance, historically. Typically, our top holdings have been 80 to 90 basis points and it’s just a much more diversified allocation across the 500 stocks. Tobias Carlisle: That’s very interesting. That’s not intuitive. That’s not something that you would expect thinking through it, but that’s an interesting outcome. Phil Bak: That’s right. Yeah. The allocation of the 500, the skew from the biggest, the largest is very different. It’s a lot flatter in reverse cap weight and that’s why we think it also has a lot of utility to be used alongside of cap weighted fund. If you say, “You know what, if this is the bridge to follow, I believe in, Google never invested reverse cap, I’m just going with cap.” Fine. Okay, that’s fine. You can do that, but then you can use reverse cap alongside market cap weight to further diversify. Phil Bak: It’s the same 500 stocks, so if you add it as a 10, 20, 30, 50% allocation alongside market cap weight, all of a sudden your overall allocation to the 500 stocks is much more diversified. If you look at it by HHI, Herfindahl-Hirschman, which is the sum of the squares of all the different weights of the 500 companies, you can bring down that HHI from 89 in a market cap weighted 100% to 33 in a 50-50. So it’s a drastic improvement over diversification. Phil Bak: A lot of people will say, “Well, yeah, the S&P is concentrated, its always been concentrated. That hasn’t really hurt me.” It’s true. But one thing that people really are overlooking is the fact that historically, while there has been a lot of concentration in the S&P 500, what we’re seeing today is not all that unusual relative to historically. What is unusual is that the top five companies now are all in the same sector and they have a lot of the same risks that are forward looking, not backwards looking like antitrust risks, risks of being able to penetrate the emergent markets. These are risks that Apple, Microsoft, Amazon, that they share in common. Whereas historically, you’d see, well yeah, the top five companies in the S&P are always a high weight, but you’ll have a utility, you’ll have a telecom, you’ll have a more diversified group of stocks. Tobias Carlisle: So your portfolio at the moment, you’re underweight technology, is that fair? Phil Bak: Well, relative to cap weight, relative to market cap weight. Yup. Tobias Carlisle: And what are you overweight in that portfolio? Phil Bak: Right now we’ve got, like you said, it’s a little bit of a value bias now. So we have utilities are a little bit overweight. I think financials, I’d have to take a look, but certainly utilities are and we’re seeing a real value bias right now. Tobias Carlisle: It’s a fascinating idea. Where did it come from? Phil Bak: And if you think about it, one of the analogies that we use a lot is tea. So nobody likes the room temperature tea. People like hot tea or they like ice tea, right? One of the other, nobody says, “Oh I want to get a cup of room temperature tea.” Well, the way we see it equal weight as a half measure, equal weight is room temperature tea. If you want that tilt, if you believe that the smaller companies in the S&P 500 have more growth potential and that’s a better way to invest, then you should invest that way. And if you believe that the market cap weighting and momentum is a better way to invest, then you should invest that way. So really, it’s kind of the counterpoint or the other balance to market cap weighting. Tobias Carlisle: That’s a great analogy. So your background before you launched your own firm, Exponential, you were with the NYSE? Tobias Carlisle: What were you doing there? Phil Bak: So I was managing the ETF listings business by the end. I was there for six years and most of the time I was managing ETF issuer, relationships and launches and market maker payment programs. So it’s a lot of very geeky nuance market structure type stuff. I worked a lot on our actively managed generic listing standards, which nobody except for a few lawyers even knows what that is. But the rules that govern a lot of the ETF listings now, everyone knows that when you launch an ETF, you have to go to the SEC to the Division of Investment Management to get approval. Of what people aren’t as familiar with is that you also have to go to the Division of Trading and Markets because not only does the issuer need permission from the SEC to launch, the exchange needs permission to be able to list it. 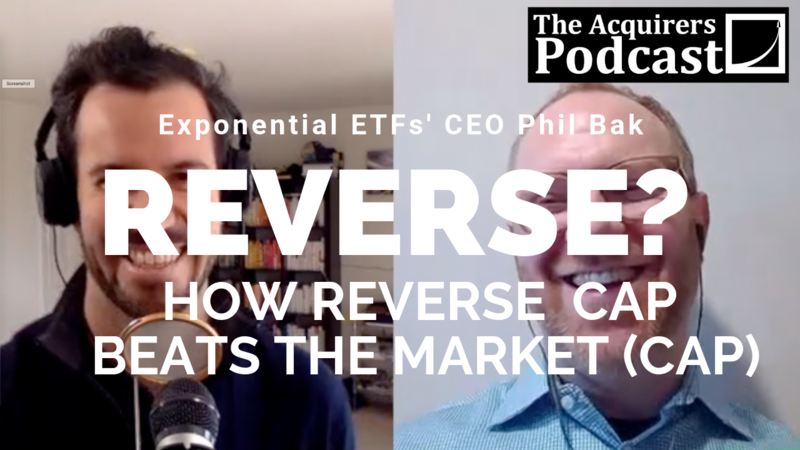 Phil Bak: And for whatever reason, the Division of Trading and markets is the place where the SEC decided to hold up a lot of innovation that have been going on in the ETF space over the last few years. So it was a lot of market structure stuff. Right after I started, we had the flash crash and spent a long time working on that and different rules to help govern that. A lot of stuff working with the market makers and a lot of legal stuff. Primarily really consulting with ETF issuers and helping them get products out. Tobias Carlisle: You must’ve seen some explosive growth in ETFs over that period. Is that the tipping point from when they sort of went from being a little bit less well known to being kind of right in the middle, right mainstream investment products? Phil Bak: The growth has actually been a little more steady than people think. We’ve had about like low 20s to 30% year over year growth in AUM in ETFs going back about 15 years now. When you talk about percentage growth, the numbers get bigger and bigger. So you see that tipping point. But it’s been fairly steady. And what started out as a product primarily geared towards fee-based advisors. I’d say about 15 years ago maybe, or really where it started to pick up steam, only in the last probably five to 10 years, people started to realize, “Hey, I can use the advantages and the benefits of an ETF in my buy and hold allocation strategies. So ETFs were natural for broad benchmarks, for hedging, for overnight cash equitization, all that. Phil Bak: Then people started to build allocation models of the ETF, and then we started to see more trading products. So leveraging inverse funds and fixed based funds in different commodities, gold because ETF has such a great access tool and a way to really have price discovery not in the home market but in the ETF. It’s just a natural. But what we’re starting to see now that I think is unique is funds like ours, like you know what, my actively managed or my rules based process driven buy and hold product that’s not going to have a super high trading volume. But that makes sense for allocators to hold over the long term. This is the vehicle that’s more efficient for that as well. Tobias Carlisle: Before the NYSE, you were at Ridex, so you’ve had a really long history in ETFs. How did you get started in investing and why were you attracted to ETFs? Phil Bak: He’s like, “Ah, I just told you, control+P, control+S.” I said, “None of them. When do I buy it?” He was like, “Oh, okay, if you’re good, you’ll figure it out.” And that was it. He walked away. And that was the extent of the training. Now, as you might imagine, those times, I mean that was really right when electronic training started to take hold and nobody can compete with an algorithm. But at the time we were coming off of an environment where people could, and there were people, there were 200 traders on the desk in downtown New York, one of them I remember was an MD that left his practice because I mean it was fun. It was like playing a video game all day and people were making money for a short time, but not forever. Phil Bak: So I just said, I’m like, “Just buy a low cost portfolio of ETFs. Don’t try to buy anything too crazy.” And one of the people that I hadn’t even been introduced to yet was in the circle that I was standing. He said, “I can’t believe you just said that. I’m about to start a company on that exact thesis.” And it was a guy named Sandra Gerber who had a hedge fund and he was just starting a company called XTF Asset Management, some of the data company XTF is a derivative of that and it’s the same company is still around. Most of the companies are long gone. We were basically an ETF strategist before it existed. But that was all the way back in, I don’t know about ’05, ’04. And I worked there as kind of a the Jack of all trades analyst type. Phil Bak: And from there I went to a company called [inaudible 00:15:13] and we were a startup ETF issuer. I built a carbon credit ETF, which is long gone, long forgotten. We did a target date ETF for TD Ameritrade. We had these health shares that were pretty much hated, mocked across the industry. But we had some stuff that was pretty interesting and ultimately the company did not make it and that’s when I went over to Ridex. At Ridex, we did the currency shares, we did the equal weights, we did the pure styles, and then I did some alternative mutual funds for which I got my career then went over to NYSE. Tobias Carlisle: So you’ve had this very long career really in ETFs, which is a little bit unusual given that they are reasonably new. At what stage do you think I need to launch my own ETF, I need to get out there and show the world what reverse market cap weight can do? Phil Bak: Well, that’s hard to say. I mean, there’s two parts of it. One is what is the validity of the idea that I’m trying to come out with and what’s the market appetite, am I solving a problem? And the other is my personal ambitions, “Do I want to start my own company?” And it was really the latter that drove a lot of it, unfortunately. I had some personal and some health issues, I had some other personal issues and I had a point of crisis in my life and I came out of it and with a very different attitude, I had been very happy at the exchange and I was very comfortable and it was a good job and I was lucky to have it and I hopefully did a good job. But when I came out of that personal crisis, I’d a very different attitude where life is short and life can change and be taken very quickly and I really wanted to maximize the time I had and really eliminated a lot of the fear from my thinking and from my process. Phil Bak: And I think what had held me back from doing something like this earlier was that fear. So what really started was not reverse cap was our flagship product, the ACSI, the customer satisfaction ETF. And that started because at NYSE of windows, the Nasdaq indexes, nobody really knows the NYSE indexes. We did have an index business, but we’re trying to build it out and we’re working on different ideas and different ways to do things. And I had a regular shopping experience. There was a Kmart near my house. And if you have Kmart by you, but it’s horrendous now. Good. It’s a good postscript to the story that, that Kmart is closed. But I had to buy a bunch of stuff from my kids for camp, like bathing suits and bug spray and things like that. Phil Bak: And the target was a bit of a drive. There’s like maybe 15 minutes away and the Kmart was right there. Well, how bad could it be? How bad could it possibly be? I’m just going to go to Kmart. It’s right here. And it was hard. It was that bad. There’s no prices, there’s no anything. I’m waiting on line. There’s like nine ladies each one of them like slowly rest there. Their purse on the counter. It’s like they’re writing a check, and I’m like looking around, I’m like, “This is horrible. I’m never coming back here.” Then I start thinking, “Well, okay, I’m never coming back here.” Let’s take me on a more statistically significant sample. Let’s say everyone who goes to Kmart today across the country has a miserable experience and none of them are repeat buyers. Phil Bak: Well, how do you capture that in the data? That’s a leading index. That’ll show up in the balance sheet, but it will show up after the fact, after next quarter when people stop coming back. So how do you capture that ahead of time and get ahead of that? And I get back to my desk, I don’t know. I was looking for consumer data, sentiment data. Wasn’t sure exactly what I’m looking for, but I start googling and searching around. It turns out the world’s expert in quantifying customer satisfaction is a professor, there was a few businesses based on that, right near me in Ann Arbor, Michigan, half hour away. Phil Bak: I had no idea. So obviously that project didn’t go anywhere, but we stayed in touch for a couple of years and in that time that we stayed in touch, we’re seeing flows move out of hedge funds, especially for domestic equity, moved out of hedge funds into the ETF and decided that this was a better structure for the investment. Once we built the team and once we had the company operationally up and running, I said, “Well, now I’ve got a team, we have all these ideas, I have all these other funds I want to do.” So we said, “All right, well, let’s start with one, pick your best idea. We’ll start there and start building out.” And that was worse cap. Tobias Carlisle: So just to go back to the ACSI, the consumer sentiment … Is it consumer sentiment? Tobias Carlisle: Satisfaction. Pardon me. So they look at the conducting surveys, how are they actually gathering that data? Phil Bak: So they are conducting surveys. They do over 300,000 surveys a year and all the data is normalized by seven different factors. We have a patented econometric model that we use to eliminate outliers and various things. So it’s a very quantitative dataset, which is ironic because a lot of people view it as more of a quantity. It is measuring something more qualitative, but the data gathering process is very differentiated from the others in that space of market research because their approach is extremely quantitative. And then ultimately, we use that as a signal. All the data is published publicly and is published historically also from in sample returns on the acsi.org. And you can see, and historically it’s a tremendous driver of Alpha both in a hedge fund and just looking at the pure data. Phil Bak: So the fund launched in November of 2016, and we don’t use any company in the fund that we don’t have a statistically significant sample on. So for example, everyone wants to know what we think about Tesla. And I personally, I think Tesla’s a cool out. I know you know, reading a lot of the debate on it is very interesting. But in terms of the data and it’s purely rules based fund, so our own opinions have no bearing on the allocations. We can’t get normalized statistically significant sample in order to be able to test of Tesla owners because there just aren’t enough of them. So we’ve really good data on Ford and Honda and Toyota and all the others. But until we have that data set, we can’t use Tesla. So it’s an interesting product because there are certain areas where we have better data and worse and there are certain sectors that are more elastic to the data than others. Phil Bak: If you think about it, like if 20 people get food poisoning at Chipola, in Massachusetts, you’re going to have a 15% reduction and people walking through the doors in Texas across the country the next day. Immediately, there’s high, high elasticity there. Whereas Wells Fargo could have another banking scandal and you’re not going to move your mortgage. You’re probably not gonna move your wealth management account the next day. It’s a much longer cycle. So because of that, we look at the data sector by sector in order to capture the different elasticities, all the allocations are relative to its own sector of all the different stocks. Tobias Carlisle: … and you aggregate that up and then you look at it on a sector by sector basis to create the portfolio? Phil Bak: Exactly. Yeah. So, we’re not measuring sentiment or satisfaction on stocks. We’re looking at the products and services and then we roll them up. So yum brands will have many scores and will have a proprietary model to estimate revenue contribution and to put that into the overall score. Because again, we’re not looking at sentiment and whether people are going to buy or sell the stock. We’re trying to understand, “Are there going to be repeat buyers? Does the company have pricing power? How is Apple able to charge three times the amount of some of the Chinese phone manufacturers in China, three times the amount for phones with identical specs?” That’s because they have the pricing power through the brand, through the customer satisfaction. Maybe it’s through the ecosystem that people are locked into, but those are the things that we can capture that we feel are not necessarily priced in. Tobias Carlisle: So it’s very much a leading indicator in it. It shows up in earnings quarters or maybe even a year or so later? Phil Bak: Yeah. Our research shows three to 11 months is the timeline that from when we start to see changes until we see it. Typically, we’ll see it hit in the form of a big earning surprise. So you get a big hit or miss and it says, “Oh wow, I can’t believe I used Kmart before as an example. I can’t believe Sears. I can’t believe Sears missed.” Well, can you? I mean, think about it. Would you want to be stuck having to go shopping at Sears? Probably not. It’s always intuitive after the fact. You never see a company or very rarely see a company go out of business or face troubles where it’s like, “Oh wow that’s so surprising because I loved that product or I loved shopping there.” Very rare. Very rare. Tobias Carlisle: What’s the unifying theme between your ETFs? How are you selecting ideas and moving them towards a fund or electing not to proceed with them? Phil Bak: What we think is going to happen long term in the industry is there’s going to be a convergence between active and passive, where active management is going to be transparent, rules-based systematic processes and all of our funds have that in them. So everything we do as an index fund and of course an index fund in the parlance of we’re creating an index that fall as a rule set. The rule set is all transparent and public so everyone could see exactly what we’re doing, and then when we manage the fund as portfolio managers, we’re managing to the tracking error of the index. Phil Bak: So we can’t say, “Oh, we’ve underperformed for a little bit. We’re going to try to catch up and make a bet.” That’s taken out at the table, which I think is a big benefit for investors. But we wouldn’t do anything that we don’t think has longterm viability where the investment thesis should in our view be as valid 10 years, 20 years, a hundred years from now to the extent that we can see as much as it is today. We don’t do a lot of the, kind of fast money products that we think are hot right now but may not be hot 10 years from now. Tobias Carlisle: So just for people who don’t know, can you go through the process of how does somebody set up an ETF? From having an idea to getting it listed on an exchange? Phil Bak: There are different ways that you could structure it and depending on how you do it, it could be a difficult process. It could be a pretty easy process if you use a lot of service providers, is not an insurmountably difficult process. So it can be done and lean on your service providers if you’re thinking about doing it because they can be of a lot of help. The key player that a lot of people don’t know, the kind of the unsung hero in a lot of cases is the fund administrator. And the fund administrator does a lot. They calculate the NAV on a daily basis, but they also interface with the authorized participants who create or redeem. And all this is kind of behind the scenes. The ETFs are so elegant and simple on the front end, you buy it, you get the exposure. It’s really easy to do. On the backend there’s a lot of moving parts. Phil Bak: So ETFs are created or redeemed in blocks of shares through authorized participants. I’m not going to bother explaining all that, but if you think about it in terms of when you buy a pair of shoes, you go to footlocker and buy a pair of Nike’s. Nike doesn’t make any money. They make money when they drop off a truck load of shoes at footlocker and then you go and you buy a parent draw down the inventory. So the APS, they’re the ones who were sending those truckloads of shares of the ETF to the market and then the market makers are selling them one pair of shoes at a time. This is kind of one way to think about it. The administrators also handle all the catch and when you talk about taking the fees out of the fund, that’s all handled automatically by the fund administrator. Phil Bak: A lot of the compliance functions are handled there. So the key things to think about are, you have a trust, you have an advisor, and then in some cases you have a sub advisor. We act as sub advisor for a lot of funds and all those three levels really manage what we’d say is like the primary market of the ETF. So what happens between the authorized participant and the fund itself and what the fund is holding and trading. And then you have the whole secondary market, which is the capital markets function and that’s the market maker, the lead market maker, the exchange where it’s listed, the tracking error of the fund. So what’s the difference between where the bid ask is in any given moment and where the fair value is. And that needs to be managed as well. Tobias Carlisle: So your own personal investments, how is that philosophy sort of manifest in the firm? Phil Bak: You don’t want to invest the way I personally invest. So I have over 100% probably of my personal in exponential at the company. So we’re just hitting our third year. We’re still early stage and we’re at the point where to the extent that I had additional discretionary income, I’d be putting an investment into the company to help build out. The way I would invest for my grandmother or would [inaudible 00:27:54] I believe in our funds 100% to the extent that I believe in equity investing, I think that personally, there is a very high likelihood that markets could be choppy going forward. I think that a home country bias is very pronounced and the valuations in the U.S. are very pronounced. So I think our funds are the best if possible. I don’t know what I’m allowed to say in compliance, but I believe in our funds in terms of domestic equity exposure. If I was designing an allocation model for myself or for a client, it would be more diversified than that. Tobias Carlisle: Right. That home country bias is very pronounced in lots of different portfolios just for the simple reason, it’s so hard to invest in foreign markets because you get the techs complication and withholding and all of those sort of issues. Are there any funds that you don’t manage who deal with that well, do you think? Is that something that you would examine? Phil Bak: I think there are some interesting funds. Yeah. So, there is no equal weight. Of course, along with reverse cap, I believe very much in equal if it reverses more of equal than equal, but there’s a real lack of options in international and emerging markets outside of market cap weight when it comes to ETFs, if that’s the way that you can access it. I think that when you look at a lot of the foreign markets and you look at market cap weighting, the biases or the bias, but the concentration is even more pronounced. When you look at Taiwan, it’s like over half Taiwan semiconductors that’s unmanaged, and unconstrained. if you look at the broad MSCI global, I think right now U.S. is over 50%, which is very risky. Phil Bak: So, look, I believe in diversifying my bets and I would most likely, and I’m kind of throwing us off the cuff, but I most likely take more of an equal weight approach to the different markets, even if they’re smaller. To me, that doesn’t necessarily need to be reflected in my bets. I think that a lot of the emerging market funds that I believe there’s one that equally weights China, Russia, India, and I think there’s one the allocates evenly among those. And that would be something that I would find more appealing. There’s also a very strong thesis I think about the consumers in emerging markets, there’s a couple of funds that address that, and I think there is a very good reason to be more bullish in those. Phil Bak: There’s also an upcoming fund that allocates based on freedom, which I think is really a fascinating concept. I’m very interested to see how that does for international exposure. I think that will probably be a little more underweight China than I personally would want to be. But within a lot of the allocations, I think it makes a lot of sensors, a direct correlation cannot deny there’s a direct correlation between economic freedom and prosperity that follows. Tobias Carlisle: The exposure to foreign markets is a very tough one. It’s one I think about a lot because I was born in Australia, raised in Australia, so I look at the Australian index and the Australian index is half financials and I think it’s 15 to 30% basic materials that you might expect because it’s a mining country and Australians are overweight. Tobias Carlisle: The Australian index, Canadians are the same. It’s a heavily financial, lots of basic materials and Canadians are overweight, so it becomes hard to kind of get out of your own stock market, home country bias. It’s real for everybody else in the world. The thing that makes it pressing for U.S investors I think, is that the U.S. is overvalued relative to the size of its GDP in a global sense, which is something that happened in the ’80s to Japan. Tobias Carlisle: It was a massive stock market relative to its GDP, which was no doubt, very big. That’s a theme that I think is probably that the U.S. goes back to sort of the stock market goes back to its sort of a GDP weighting globally. Are there any broad themes that you look at and maybe move an ETF in that direction or just for your own personal investing? Phil Bak: Well, I would say that the market doesn’t care where you live. So the whole thing about the home country bias, if anything, you would want to be underway your home country, because you already have enough exposure to that economy. The economy goes to hell where you live, you’re going to feel it. You want to be diversified outside of it more so than anything else. But I mean, look, I’m bullishing merging markets. I think we’re hitting a global world, more and more opportunities and technologies are being as readily available across the world as they are in the countries where they’re developed, be it here, be it in Europe, be it anywhere else. So I think we’re going to continue to see emerging markets and even frontier markets to a degree catch up in those markets where there is the right environment, where you do have that economic freedom, where you do have the right infrastructure, where you do have a trusted government. I think when you have the right infrastructure in place that can happen, it can happen quick. Tobias Carlisle: What about other broader themes besides sort of geography? Is there any consumer products or developmental technologies that lead you to thinking? Phil Bak: I like alternatives. So specifically market neutral alternatives, especially given where like into here where I think we might be in a cycle, so funds like MNA theme funds or funds like that, different spreads, commodities are interesting. I mean, it’s impossible at the time. Commodities, we’re looking at some signals and commodities that nobody’s ever looked at before and we’ll see what the results are. We’re close to getting results on a thesis there that may or may not lead to something. You never know. You run these as you know, you spend a lot of time at data. Sometimes you have something amazing, sometimes you don’t, the data tells a tale. But I think in general when you look at alternatives, people think, well alternatives are hedge funds or alternatives are PE and you can have a broad equity value product of a strategy that’s delivered in hedge fund PE. Phil Bak: I think there’s some research now that says, “Look, if you take leverage microcaps you’re going to get the same thing as a PE, manage the smoothing effect. So you get more liquidity that way. So when people talk about alternatives, I think they’re kind of missing the point. You want something that has no correlation to stocks or bonds where you’re already have too much exposure not you personally but most people and a lot of those old strategies like convertible bond arbitrage is one that I like a lot. Other long short strategies, I think there’s more opportunity to do funds there and I think those are places where I personally love to invest. Tobias Carlisle: That private equity model is a good one where you only have to report on an irregular basis or quarterly basis and so you can’t see the movements in between. It does give that impression of having very smooth returns. Phil Bak: But no matter how bad you are, it’s like flipping a house in the middle of a housing boom, no matter how bad. All right, so I thought I can spend $20,000 on granite and then $30,000, it doesn’t matter because the market saved you anyway. The market went up by so much that you can’t lose money. And I think we see that now with PE, not to say that there aren’t great private equity companies and investors there are, but the idea that any private equity company is just a better bet than the public markets doesn’t seem like something that could hold on an indefinite time horizon. Tobias Carlisle: That was Dan Rasmus, and I think he did that research advert where he said, if you looked at the factors driving the returns of private equity tends to be, it’s a leverage small cap bet that he can capture. I don’t think he has an ETF, but he captures it in an LP anyway, just investing in public markets. While we’ve got the expert on ETFs, the question that I’m very interested in, there’s a talk of that the ETF rule, when that is implemented, can you just explain what the ETF rule is and what you think the prospects are for that being implemented in the sort of short to medium term? Phil Bak: If you look at the ETF, the SEC rules that govern the ETFs, like I said, there’s a few. You have the exchange rules, you have the 40 Act rules, you have the registered investment company. I mean, there’s a whole bunch of different rules. But the main rule that covers ETFs is called the 40 Act rules. The 40 Act stands for the 1940 Act. In other words, 80 years ago, literally ETFs are being governed off rule that’s 80 years old. I mean, how crazy is that? 80 years ago there were no ETFs. There were certainly no vix futures. I mean, these funds are being governed. So in order to be able to listen to ETF, you have to abide by the 40 Acts. So you have to exempt herself from, which is a mutual fund rule, so you have to exempt yourself from those requirements that are like a fund and not an ETF. Phil Bak: It’s a little bit confusing, but basically in those ways that the ETF differs from the mutual fund, you need this thing called exemptive relief that says that you’re allowed to be an ETF who knows ways that are different from what’s laid out in the 40 Act rules. And that makes no sense to have a rule like that and to have an exemption like that from an 80-year-old rule. But now all of a sudden, ETFs are the investment vehicle of choice for the modern investor. Phil Bak: So the SEC has been working on a new rule called the ETF rule and more directly and instead of managing by exemption is going to manage more proactively say. These are the rules that level playing field, you don’t have two companies that could do leverage and nobody else can, two companies that can do custom creation redemption that nobody else can. It’s gonna be a level playing field. Here’s the line in the sand of what will allow and won’t allow and everyone can go ahead and launch their fund knowing what the schedule or what the requirements are. Phil Bak: So net is a good thing. It’s going to take a long time to come out. People think it’s ready to go. These things always take longer. The SEC hasn’t published it yet in what’s called the Federal Register, which is really the first step of the process. Then it goes through a lengthy comment period, assuming there’s going to be a lot of comments, which there are. It could go for a process as long as 280 days. Every lawyer is going to want to weigh in. Every capital markets desk is going to want to weigh in. There’s little issues around the edges that are kind of up for debate. I think the core rules are pretty much consensus. We’ll agree to them. I think they’re pretty straightforward. Phil Bak: Now it was very kind of the SEC to wait for every company that wants to just to kind of have exemptive relief before they announce that they’re working on this rural because you’re solving a problem for companies that are coming in to get exemptive relief that most companies or most large asset management companies already have. So it would have been very helpful 10 years ago. Today, there’s now a trickle of new exemptive relief that are coming out. That exemptive relief process, if you’re not doing anything too funky, if it’s a vanilla strategy, you can get that exemptive relief in a few months and it’s not that challenging. Phil Bak: There was a time where there was a year or two years and rumors that lawyers would charge way above million, $2 million in some cases to get it. At that time back then it would’ve been very helpful. Now it can make things a little more efficient. It’s not going to have the biggest difference in the world. Companies can still, now they can get their own exemption in between until the ETF rule is out there and it’s not prohibitively expensive or timely anymore. Tobias Carlisle: I think it was proposed something like 10 years ago. Initially it wasn’t, just they’ll pick a fish to fry at the time because the global economy was tanking, but it sounded like it was going to come back on the books last year, but still not yet. Phil Bak: Well, the SEC did publish kind of their working document and what they’re thinking in terms of the rules and they opened it up for comment periods and a lot of the industry commented. There are things around the edges that will cause some debates. So for example, the IOPV is the entire day, the every 15 second value of the fund that gets published in real time. And some people think it’s very helpful. I think it’s very helpful if you’re trading a fund and there’s a wide badass spread, you can reference it and see what the fair value is in real time. A lot of people think it’s harmful because there’s nobody really vetting out if the index provider’s right and is that truly fair value and they have a whole host of ETFs that are open either from a foreign market while the foreign market’s closed or in fixed income. Phil Bak: You don’t have real time transactional price to price it off. So in some cases it can be harmful, you can get bad data. So there’s a lot of debate in the industry, whether that should be killed or kept and is there value there? A few things like that that are kind of around the edges that people are going to argue about but I think what will happen is just the SEC timeline is always longer. Always bet the over on an SEC approval, always. Tobias Carlisle: One of the interesting things that might happen is that at the moment the index funds get a special capital gains, tax treatment that’s not available to active funds. Do you think that that gets implemented and what do you think the impact of that is? Phil Bak: I don’t know. I don’t know much about that and I’m not sure if that will come to pass. Phil Bak: Yeah, I wonder if that’s right. Yeah. And it’s a huge advantage. I mean, that’s probably more than half of the ETF advantage right there. And that’s why you see ETFs so popular in the U.S. and popular but less so outside the U.S. because you don’t have the same tax benefit. I think what that might be is nontransparent active ETFs. So when you’re looking at an active ETF, I think the easiest way to think about it right now we have active ETFs on the market, but there are daily transparency, meaning that they disclose on a daily basis of what they hold with the T plus one leg, so we really see two days ago what they held. But you can see on a daily basis of what they held. Phil Bak: So if you think about an index fund and you think about the way an index fund re-balances, let’s say an index would rebalance every single day. It’s the same operational process that would be what we call active transparent. You publish basket, the portfolio manager trades the next day. Everyone sees and prices off the new basket. What a lot of people are working on now are nontransparent active where there’s total discretion and the ETF manager would show their holdings on a quarterly basis. Phil Bak: So one methodology is to use what’s called a proxy portfolio where either you run a risk factor optimization or you do some other representative basket. You say, “This is similar enough to what the actual is,” and you price off of that. Another one is to use a blind trust where you have only the market maker knows what’s in it and nobody else. I think all of those have some issues. They solve some problems and kind of remains to be seen whether the SEC will approve those or not. If they did, I think a lot of those structures could lose those tax benefits because if you can’t create or redeem in real time, which you can’t do if you don’t know what stocks to deliver, then there is no income transaction, and that’s where ETFs get that tax efficiency. Tobias Carlisle: That’s a great answer. Phil Bak, thank you very much for your time today. If folks want to get in contact with you, what’s the best way to track you down and see what you’re doing? Phil Bak: exponentialetfs.com is where we are. I’m on Twitter a lot too much on philbak1. And, yeah, thank you, Toby. Thanks for having me on.